A Love Spells laugh-out-loud cozy paranormal romance by USA Today bestselling author Mindy Klasky. Dr. Ashley McDonnell, a witch, always knew running a hospital for paranormal creatures would be a challenge. But then she lost her magical powers. And Empire General’s operating license was put in jeopardy. And the most valuable supernatural drug in all of Washington DC was stolen from the hospital’s impermeable safe. Now, Ash must work to regain her lost powers, even as she fights to discover who is undermining the hospital’s upcoming inspection. All of which would be a lot easier if she weren’t distracted by Secret Service agent Nick Raines, a newly turned vampire who appeared at Empire General the night everything went wrong. 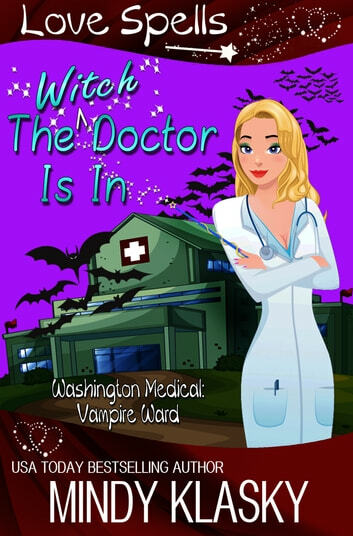 How can Ash regain her magic when the vampire making her hormones hum may be the man sabotaging her career? "Dreaming of a Witch Christmas"
Mindy Klasky has hit another home run with this first book in a new series! Set in a hospital for paranormals, we are introduced to fabulous new characters that Mindy makes us care about in her amazing style. Highly recommend and I can’t wait for the next instalment! !